Ebenezer and Jane Bear’s first son, George was born at 24 Wellington Street, Greenock on 30th October 1874 and duly announced in the Greenock Telegraph on 31st October. In the Post Office Directory for 1878/79 Ebenzer is shown as having a Hatter’s business at 7 Hamilton Street. However, by the 1881 census the family has moved to Glasgow and George is now shown to be a hatter’s assistant. George studied at the Glasgow School of Art under Fra Newbery and James Dunlop and after he graduated he spent several years in Canada. He was married on 19 July 1906 to Sarah Macquarrie in Kilmacolm. Later he moved to the artist colony in Kirkcudbright and set up home at 9 High Street. 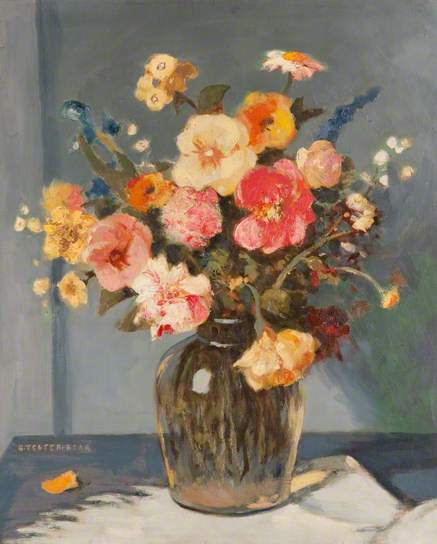 One of the other artists included another Greenock born painter, Ernest Archibald Taylor (they were born within a month of one another). George exhibited regularly at the Royal Scottish Academy and at the Royal Glasgow Institute. Latterly he lived in Kilmacolm and died there in 1973. 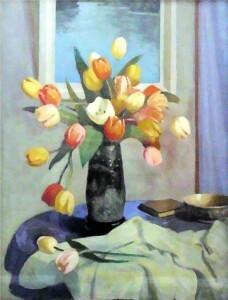 He presented 2 of his flower paintings, Tulips and Summer Flowers, to the McLean Museum and Art Gallery.